The glory days of summer have brought more than unexpected scorching temperatures to musical Europe. Accompanying the heat wave, high spirited music festivals follow close at the heels of the mega-music contests: the esteemed Queen Elisabeth and the ever polemic Tchaikovsky Competition. Intriguing blog posts at violinist.com have discussed the results of the Tchaikovsky Competition Violin in great detail. Yet, whereas the violin and cello competitions showcased outstanding technicians, it was the piano forum that reached another level of magic and musical intensity. Now consider the fact that the piano is a percussion instrument and challenge yourself to apply his free-flowing phrasing to the violin. Instead of visualization, go for auralization. The temptation to analyze technique, a leading characteristic of our hypercritical fellowship of fiddlers diminishes as we focus on a different instrument. And now for something completely different! Several of the most extraordinary recollections in the early days of summer came courtesy of nonprofessional ensembles. Far from the rarified stratosphere of world-class competitions, student orchestras from every part of the world are performing at festivals. This year’s Lisbon Music Fest 2015 brought together classical, jazz and big band groups from Ireland, Latvia, the Netherlands, Switzerland and the US to perform in spectacular venues and share the joy of music with enthusiastic locals. Expecting no more than cacophony, I checked out several ensembles to discover that student orchestras are not only noteworthy for camaraderie and plain, old fund but for real musical substance and repertoire choices that go standard orchestral fare. 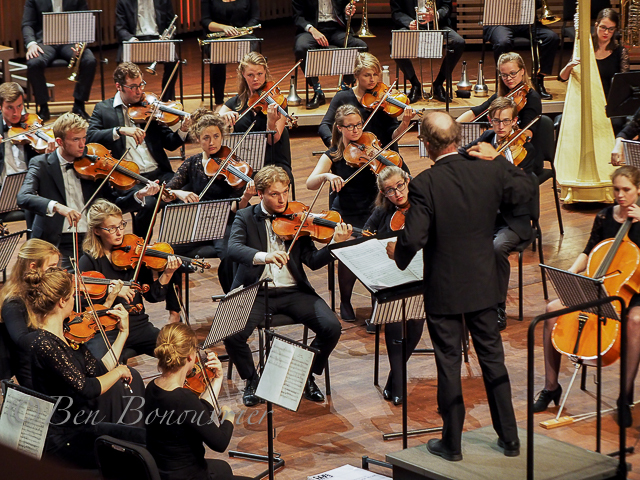 A well-nuanced performance of Johan Wagenaar’s symphonic poem, Elverhoï by the Dutch-based VU Orchestra convinced me that the long-forgotten gem deserves pride of place in the major leagues. With all the hue and cry on the demise of classical music that wafts through the media as major orchestras head for the bargaining table, a focus on the positive is warranted. Go forth and celebrate!